Ron Freeborn has painted all his life. After studying Fine Art for 4 years in the fifties, he served for two years in the Forces (Cyprus). He was Head of Art in Didcot, Oxon. for the last 40 years, and he has planted firm roots at the edge of the Berkshire Downs over this time. His paintings are in private collections in all 5 continents, and in the Government Art Collection. He specialises in teaching senior students (from 6th Form, A-level upwards), experienced painters, & graphic designers. For one year he was seconded to M.O.M.A., Oxford as Education Officer. 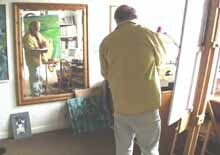 His painting subjects cover a broad range and he has various styles: Venice, landscape, figure compositions, portraits, abstract, still-life, Theatre, Opera. He works generally on a theme for a considerable period using different materials; oil, acrylic, pencil, ink, chalk, water colour etc. He is both prolific and experimental, and he says of himself “ that being involved with teaching for over 40 years, I am continually exposed to various influences and motivations from students. Your mind is kept alert by ideas, opportunities and countless visual images, which follow you home. I find that guiding and encouraging people to be creative is very rewarding and simulating, and you often find that you `shoot from the hip’! It requires energy. It is not surprising therefore that my own work is diverse in realisation and subject matter, which also reflects my various interests and lifestyle. I continue to rejoice in making marks in line and colour and creating a pictorial structure from virtually any source that appeals. The content of the subject determines the approach." 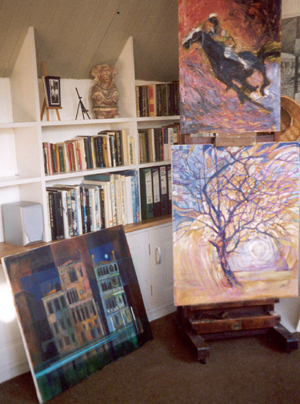 Ron Freeborn’s work is influenced by travels abroad, and his considerable involvement in performing arts. Ron is a trustee of the Blewbury Players, he has directed all 6 of the Blewbury Operas, and is Chairman of the Oxford Concerto Orchestra. This has led to a tremendous variety of experience, and styles, which indicate an artist enjoying the fullness of his talent. He has many successful one man shows over the years and continues to exhibit mainly in South Oxon. His annual course for experienced artists to Venice is always over-subscribed. In recognition of his talent as an artist, Rons work has been selected for the Government Art Collection and is displayed on their website.